Understanding paper weight and thickness can be difficult due to the archaic measurements / descriptions used in the paper industry. Generally paper is described by it’s weight and paper class. The difficulty comes about because each paper class uses a different sheet size to measure weight. 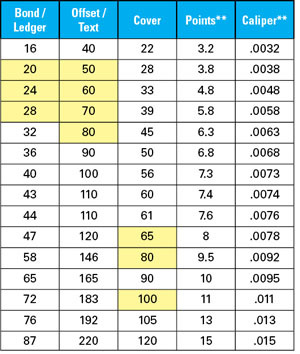 This results in a system where 80# (# symbol is the same as lbs) text is radically different (lighter) than 80# cover. To further confuse things, some papers, particularly cover papers, may be referred to by thickness (points). For example, 10 point C1S (coated 1 side) is a common reference. The following table compares paper weights and characteristics for different paper classes. For example, 24# bond is equivalent to 60# offset and 33# cover. * The colored boxes above represent common paper weights for that class. 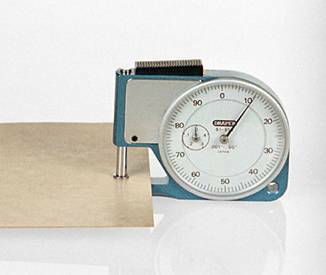 ** Normal paper manufacturing tolerance is + or – 5% to 7% caliper. Please note that Points and Caliper are for uncoated papers and are a rough estimate. Points and caliper can vary significantly depending on paper density.